At the age of 19, Del’Monte had aged out of a local group home and was trying to make it on his own. 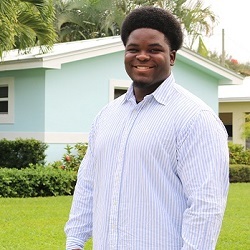 After being accepted into Villages of Hope, Del’Monte now had a safe place to call home and the support system he needed. He quickly set goals and was determined to finish high school, enroll in college, save money for a car and eventually, move into his own apartment. He proved to be a hard worker and remained committed to our program, following the guidance of our Residential Manager and his mentor. Within 18 months, Del’Monte earned his high school diploma, secured two great jobs and purchased his first car! While it was not easy, he remained focused and stayed connected to those who wanted to see him succeed. After years of hard work, saving, life skills classes, budget training and even manual labor, at the age of 22, he became a home owner! Through the assistance of Habitat for Humanity, he started 2016 in a beautiful, new 3-bedroom home.